Both Olee and Zinus are available in difference sizes in the market. There are no less 10 different versions of all sizes and it is a painstaking process to look through and compare each against another. However, this review and comparison between Olee Vs Zinus is limited to 10 inch and 12 inch versions as these are the best selling categories. While Olee comes with 1 inch gel layer, Zinus green tea version has 2 inches of this layer. Note: The more the size of this layer the better the cooling effect. With 2 inches thick gel infused layer, Zinus is clearly more cooler than Olee. Additionally, this top layer in Zinus is again infused with green tea extract and caster seed oil. Green tea carries anti-bacterial characteristics and it perfectly protects your mattress from harmful bacteria accumulation that mainly results from sweat absorption. It also retards unpleasant odors off the top surface. The verdict is loud and clear when it comes to top gel infused layers. Zinus 10 inch version is optimal choice as it carries green tea and castor seed oil extract in addition to cooling gel. 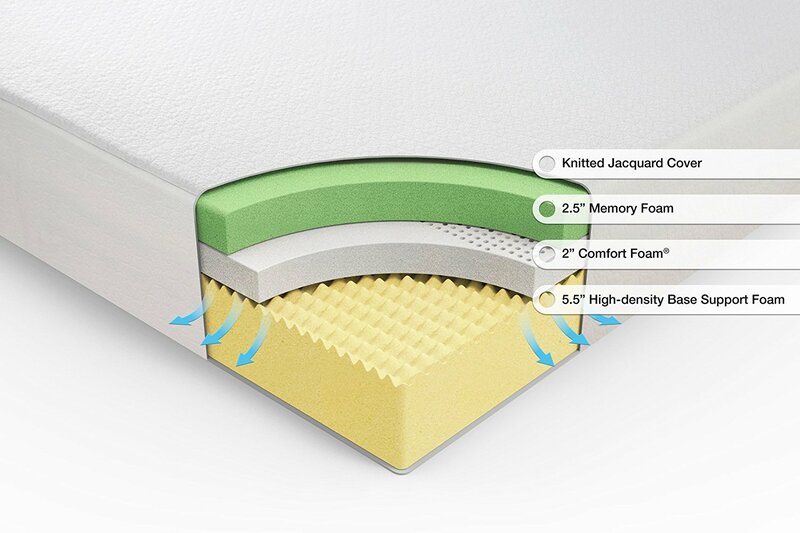 While Olee 10 inch version has two mid level layers, Zinus green tea mattress has only one mid layer sandwiched between top gel and base HD layers. Olee made use of foams with different firmness levels as mid layers, one being 25 ILD and other at 8 ILD. 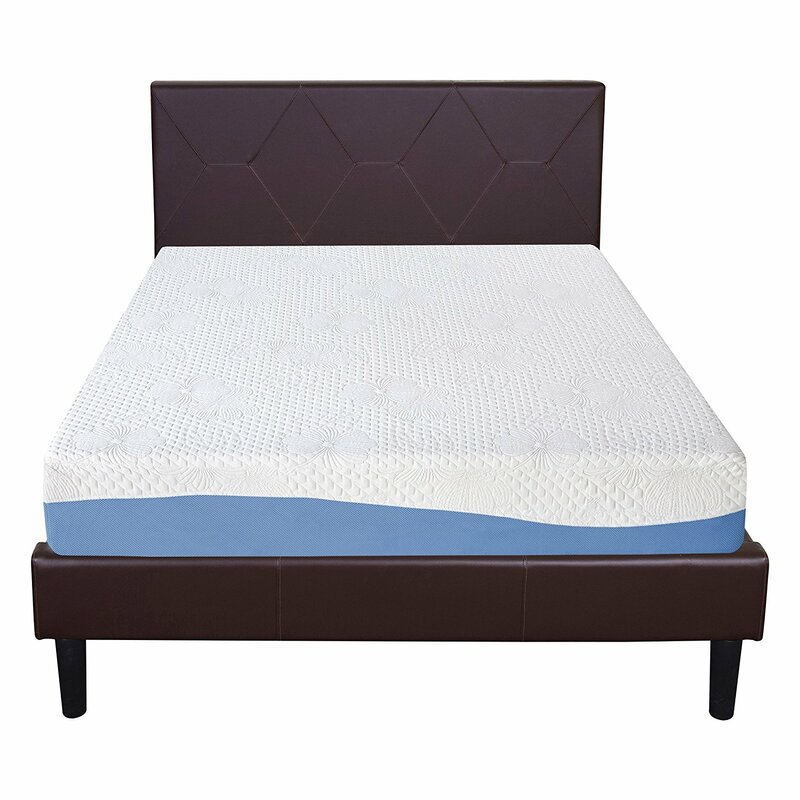 Zinus has made use of simple single soft memory foam of 2.5 inches thickness as mid layer. It’s designed to hold the body weight from directly hitting the high density hard base layer. In other words, it’s like a transition layer between the top plush gel layer and the bottom hard high density layer. While Olee mattress has a massive 7 inch high density base layer, the Zinus 10 inch version has 5.5 inch thick base HD layer. While Olee comes with polyester jacquard fabric, Zinus has knitted jacquard cover. Not much of a difference. With an 8 ILD and 25 ILD intermediary layers and 7 inch thick high density base layer, Olee Sleep is slightly more firmer than Zinus 10 inch mattress. Zinus has a single 2.5 inch intermediary layer that is again soft comfort layer followed by high density 5.5 inch base HD layer. On the whole, on a scale of 1 to 10, Olee mattress stands at 6.5 making in medium firm while Zinus with a score of 6 is neither too firm nor too plush. The 0.5 difference is because of the 2 inch gel layer and 2.5 inch comfort layer in Zinus layer construction. With 2 intermediary layers, we can conclude that Olee Sleep offers a notch better motion isolation than Zinus. Same is the case with edge support as well, Olee mattress again stands ahead of Zinus owing to the massive 7 inch thick base high density layer. Nonetheless, both the beds do hold you from slipping downwards in a sleeping position. But while in a sitting position, Olee Sleep is relatively firmer on the edges. Both Zinus and Olee are both CertiPUR-US certified thus assuring you of all safety regulatory adherence. 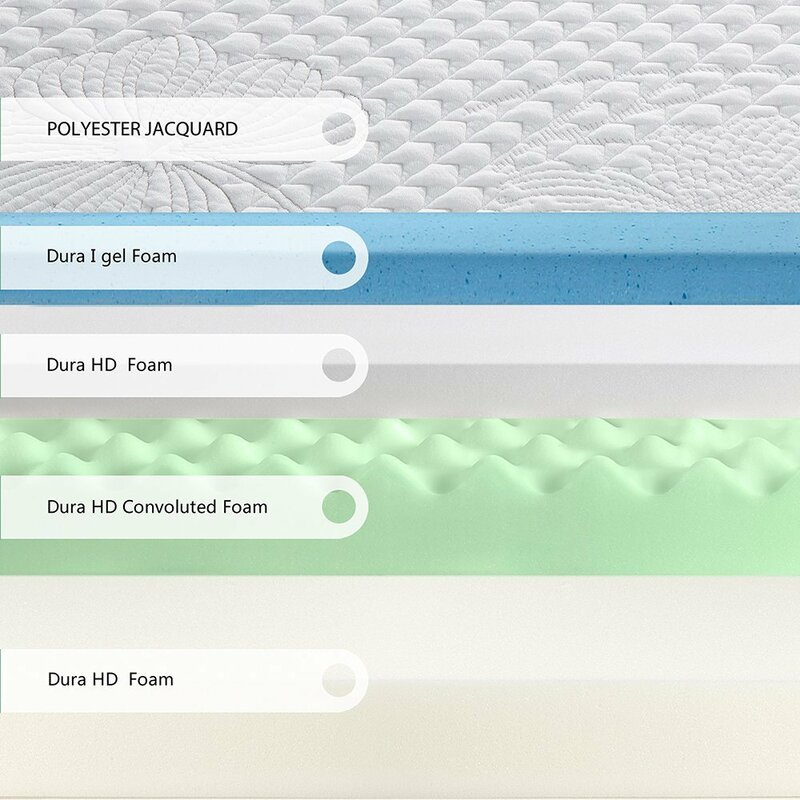 No harmful material goes into the making of these mattresses. However, Zinus being additionally infused with green tea and caster seed oil infused gives more protection from bacteria and effectively removes unpleasant odors. Cost-wise both beds fall in the same price range, however, Olee is slightly cheaper by around twenty bucks. Feature-wise Zinus leads the race, especially with 2 inch gel layer that offers better cooling effect. Additionally, the green tea and caster seed oil extracts work as add-ons giving some much needed health benefits through their anti-bacterial characteristics. But if you are looking for bit firmer version, Olee Sleep should fit your need. Else, if you are happy with neither plush nor firm mattress then Zinus green tea mattress is worth.